Photon trajectories resemble dual Amplituhedrons in Quantum FFFTheory. 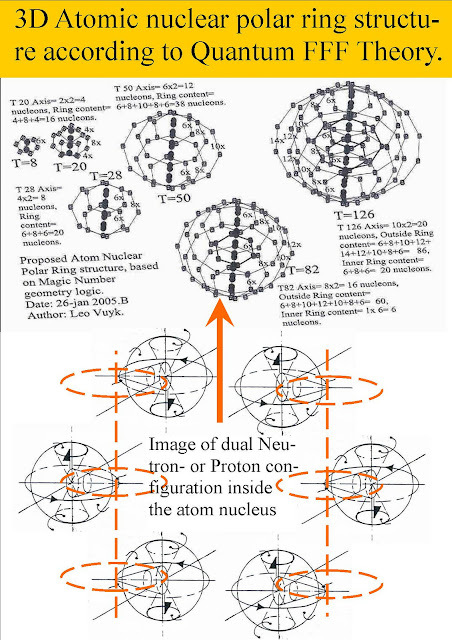 see also: the Amplituhedron presentation of a travelling photon observed from the axial center. 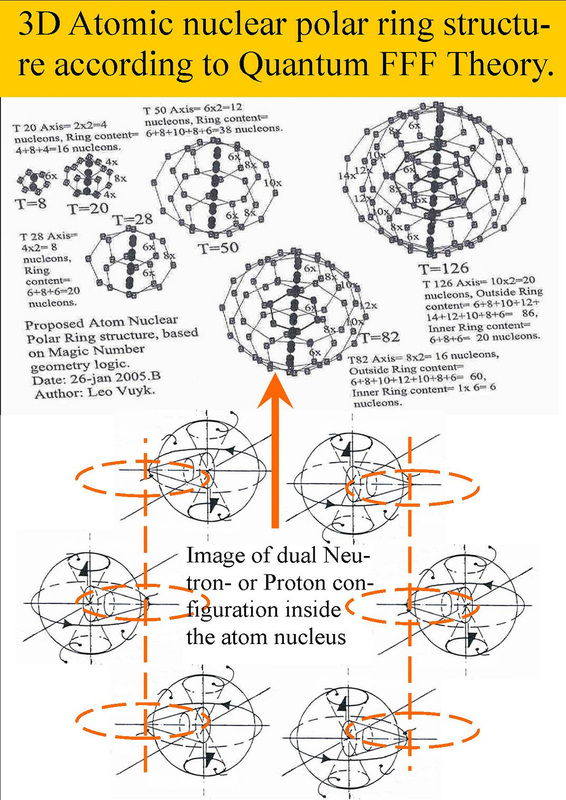 How should we interprete this dual amplituhedron as representation of photon trajectory reality? 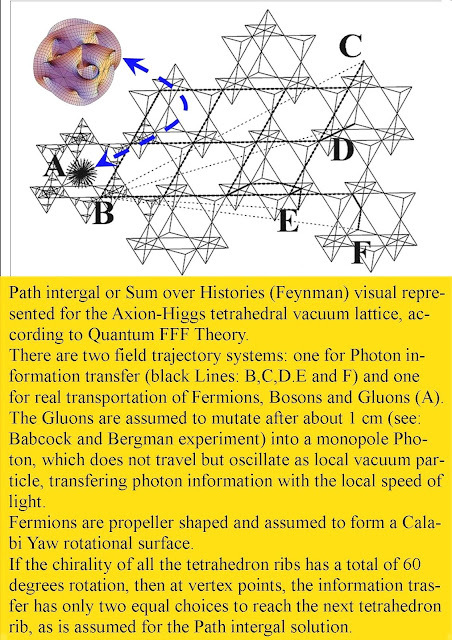 The amplituhedron picture is what youwill see of the avenues ( possible trajectories) into the direction of the photon flight around you if you stand still at the nodal point. The chirality of the vacuum lattice with only two hinges between two nodal point make the lattice show its triangular shape with 60 degrees angles of a HELIX ..
if you include the second ampituhedron of the "shadow photon" from opposite universes entangled to it, you may observe even a DOUBLE HELIX, just as the DNA images show. "Experiments to determine the mass related Lightspeed extinction volume around the Earth and around spinning objects in the Lab." Is the Universe Conscious? Yes, according to Quantum FFF Theory. However, only at the cost of a mirror symmetric multiverse. 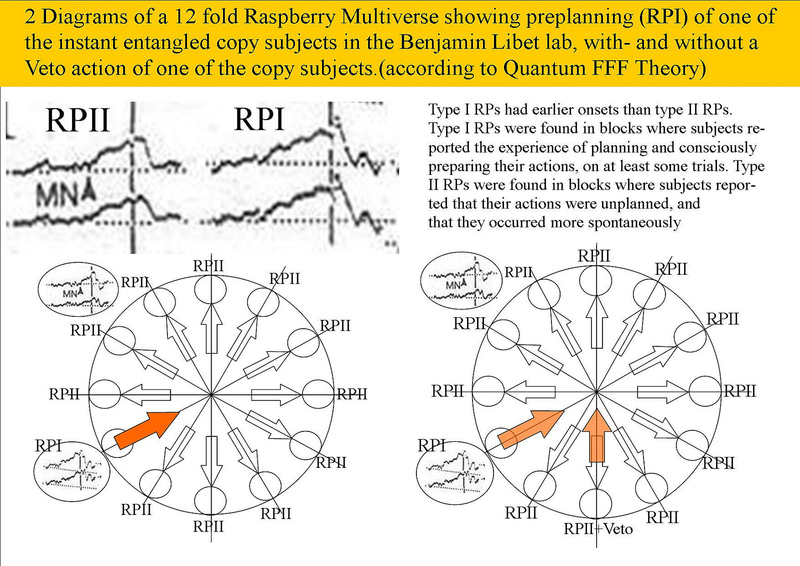 See: A Consciousness Theory of Everything based on Rigid Transformable Strings, Instantly Entangled Between 8 or 12 CP Symmetric Universal Bubbles. 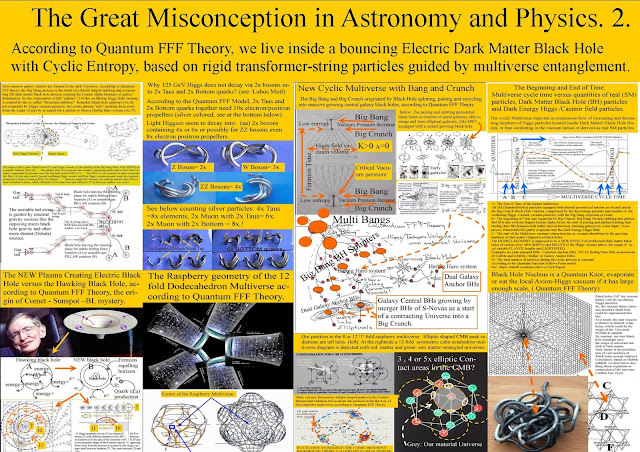 Called by its formal academic name, though, “panpsychism” turns out to have prominent supporters in a variety of fields. New York University philosopher and cognitive scientist David Chalmersis a proponent. So too, in different ways, are neuroscientist Christof Koch of the Allen Institute for Brain Science, and British physicist Sir Roger Penrose, renowned for his work on gravity and black holes. The bottom line, Matloff argues, is that panpsychism is too important to ignore.“It’s all very speculative, but it’s something we can check and either validate or falsify,” he says. 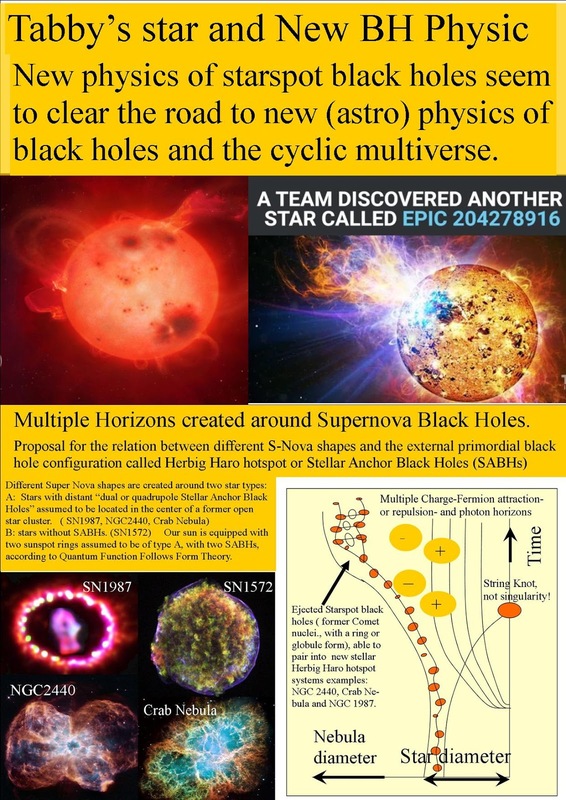 How we should approach the puzzle of the universe? 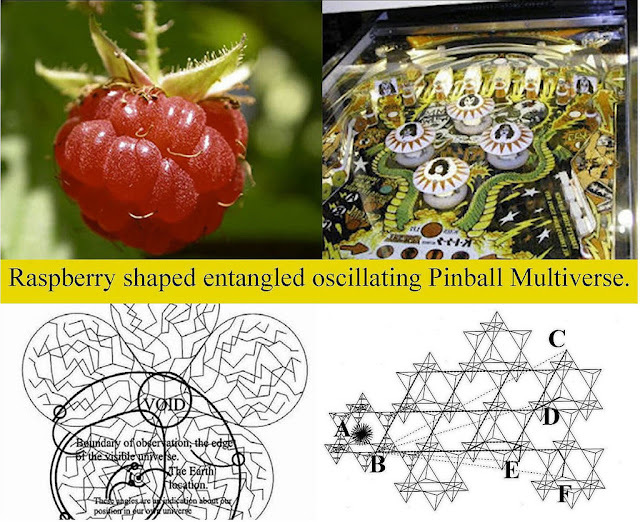 By looking at a smaller scale inside the puzzle: not observable from the outside. see the Da Vincy helicopter puzzel with the inside hiding pins. 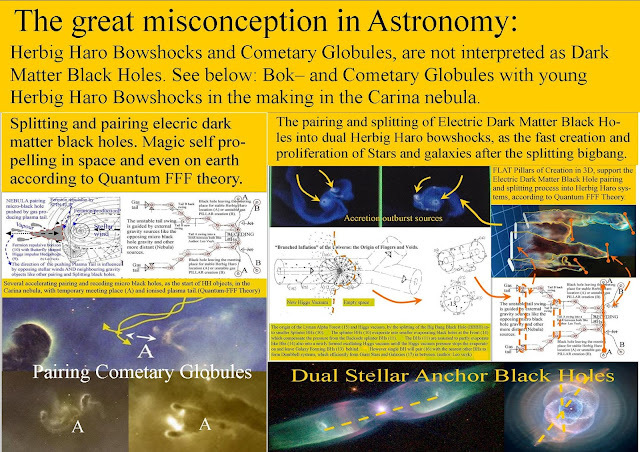 comparable with the subquantum inside hiding STRING structure of Quarks and Letons. Different Vacuum Trajectories for Axion-Higgs field/ Photons respectively Fermions, Gluons and Bosons. 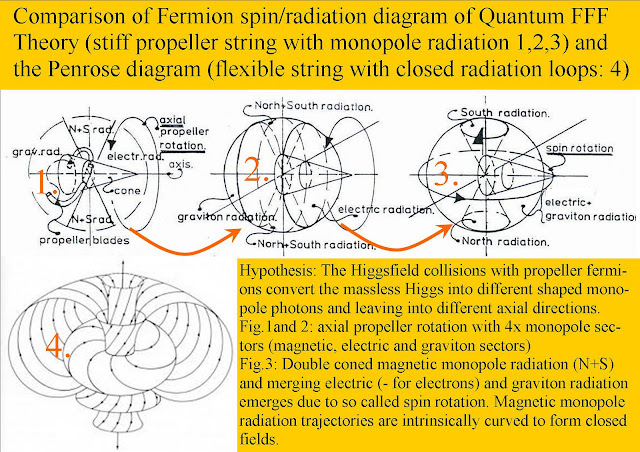 Quantum FFF Theory, a Conscious String Theory with different Vacuum Trajectories for Axion-Higgs field/ Photons respectively Ferm ions, Gluons and Bosons. 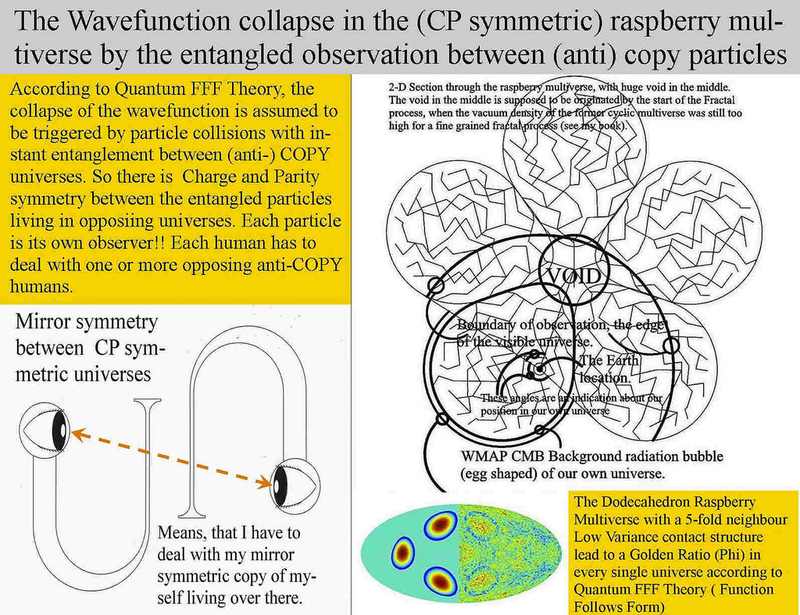 This conscious string theory also called Quantum FFF Theory, (FFF = Function Follows Form) is a semi classical theory based on a symmetrical cold Big Bang evaporation into 8 or 12 CP ( Charge Parity) symmetric copy (anti) material universes. 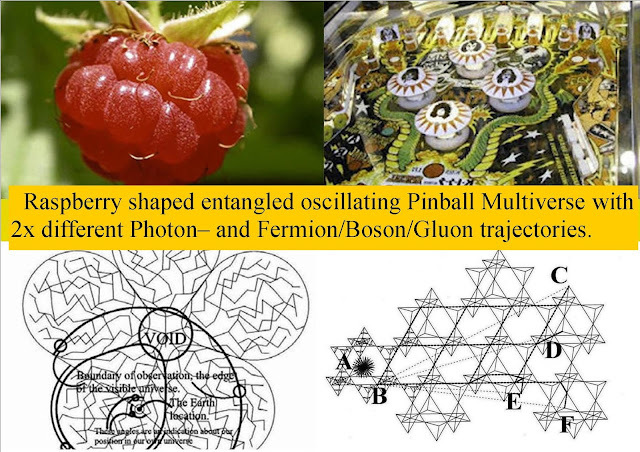 It can be called a semi classical theory because it describes reality by the real collision and shape transformation processes of real sub quantum shaped rigid stringy entangled particles. Each particle is supposed to be conscious by its entanglement with 7 or 11 CP symmetric copy particles located inside the other 7 or 11 CP symmetric universal bubbles at long distance with raspberry shape. 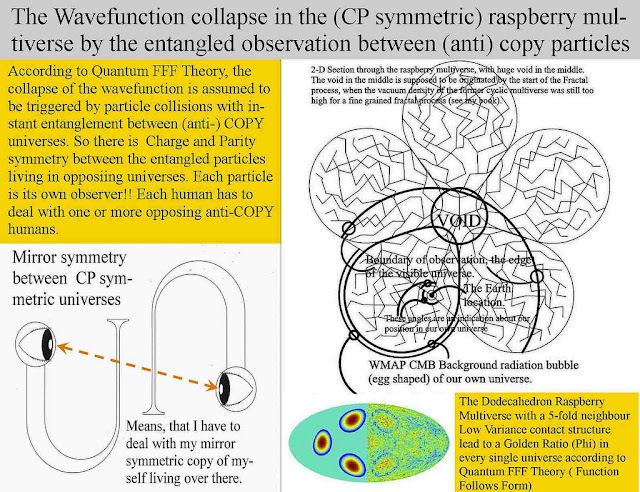 The Q-FFF theory is called Semi classical because in addition to the ring shaped transformable rigid string particles, all universal bubbles are assumed to be each others Charge Parity (CP) mirror symmetric universal bubbles which are assumed to be instant entangled down to each individual string particle created out of the Axion Higgs splitting cold Big Bang. 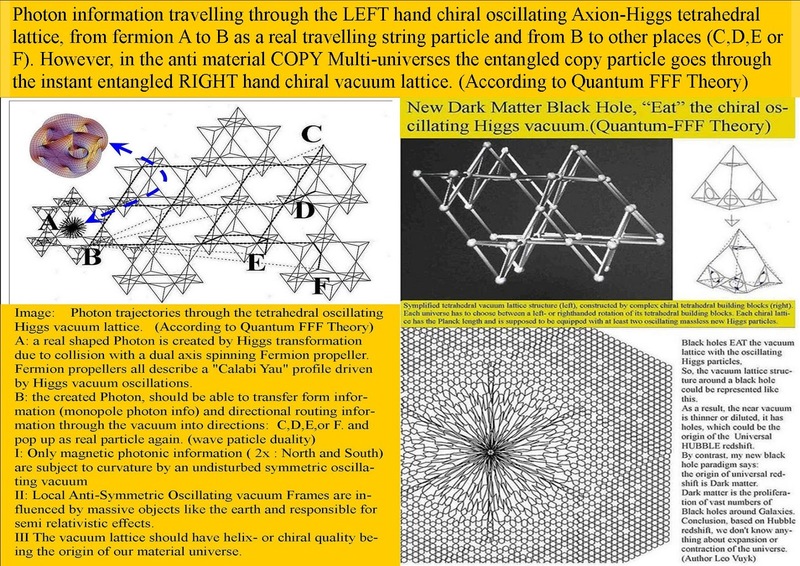 So each particle has to compete for wavefunction collapse with 7 or 11 anti copy particles and each person’s choice ( free will) also. So: we live inside 8 or 12 quantum particle based instant entangled pinball machines making choices for our own reptile brain based flash intuition down to single particle slit interference. 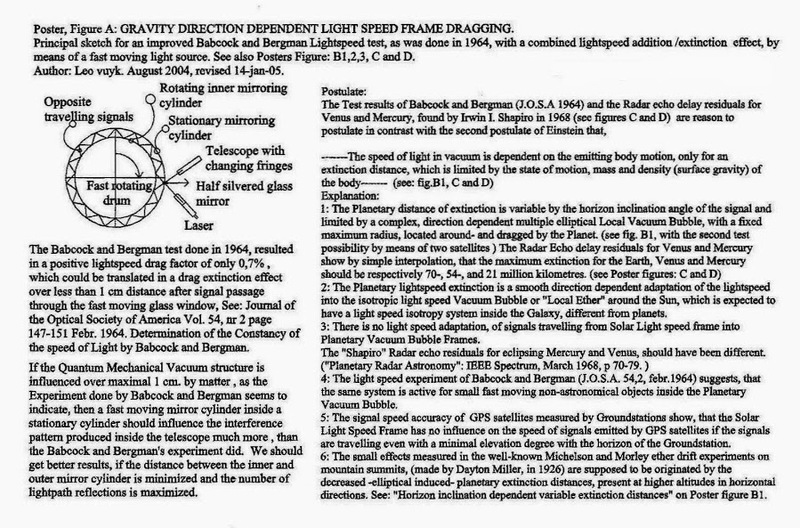 However our frontal cortex seems to be able to make social corrections ( Vetos) within 300 msec. The sheer simplicity of such a system is perhaps the reason that I could not find comparable proposals for other theories. 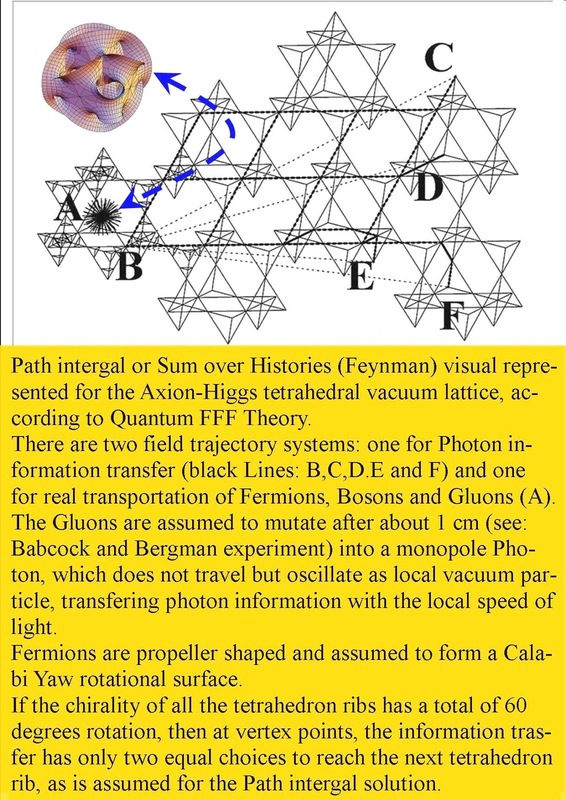 Path intergal or Sum over Histories (Feynman) visual represented for the Axion-Higgs tetrahedral vacuum lattice, according to Quantum FFF Theory. 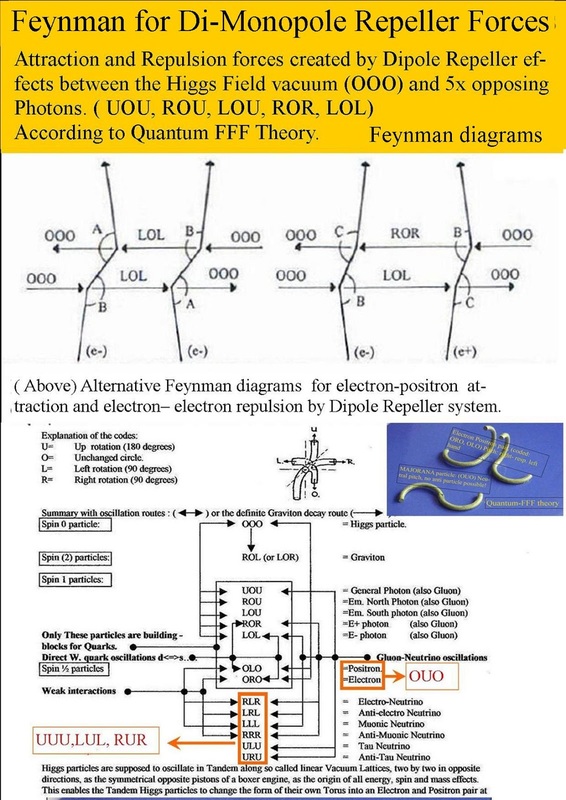 There are two field trajectory systems: one for Photon information transfer (black Lines: B,C,D.E and F) and one for real transportation of Fermions, Bosons and Gluons (A). The Gluons are assumed to mutate after about 1 cm (see: Babcock and Bergman experiment) into a monopole Photon, which does not travel but oscillate as local vacuum particle, transfering photon information with the local speed of light. 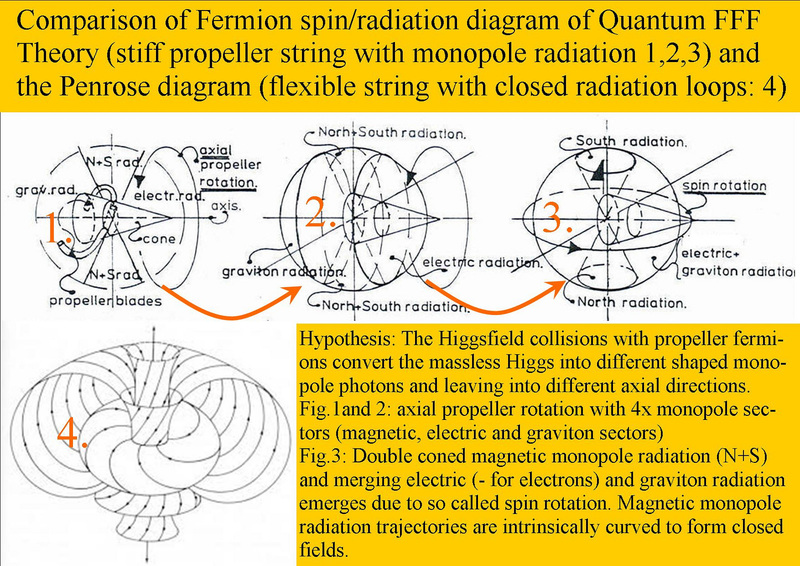 Fermions are propeller shaped and assumed to form a Calabi Yaw rotational surface. If the chirality of all the tetrahedron ribs has a total of 60 degrees rotation, then at vertex points, the information trasfer has only two equal choices to reach the next tetrahedron rib, as is assumed for the Path intergal solution. This construction in named: Statically determined. 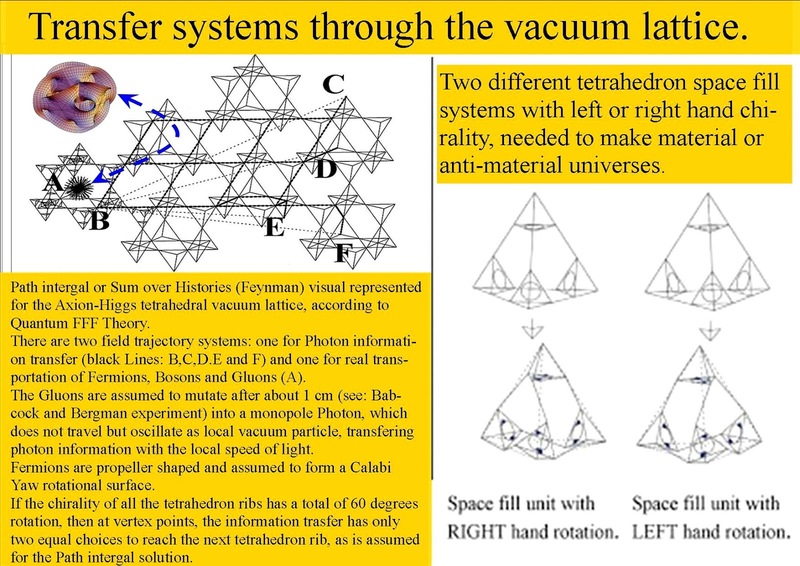 Which means that if you take one lattice away, one tetrahedron becomes unstable, however the whole structure is also unstable (flexible) in itself. A Consciousness Theory of Everything based on Rigid Transformable Strings. 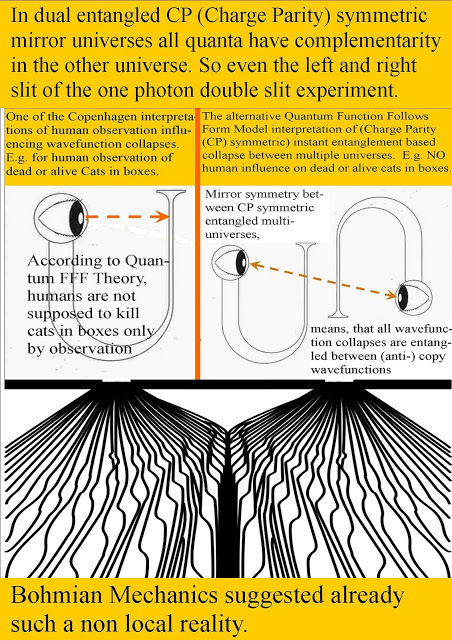 This consciousness theory of everything (TOE) also called Quantum FFF Theory, (FFF = Function Follows Form) is a semi classical theory. 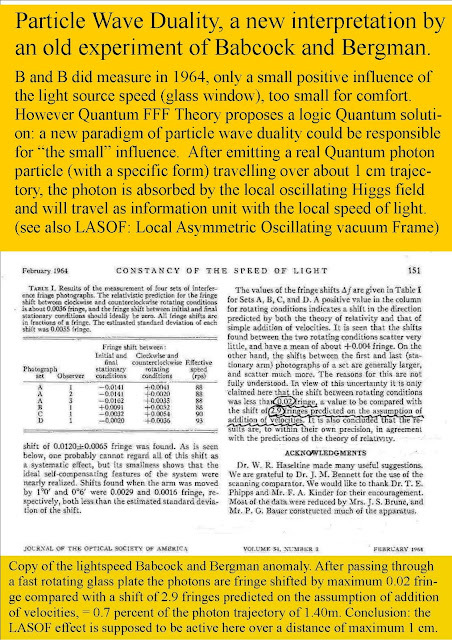 Quantum FFF Theory is a semi classical theory because it describes reality by the real collision and shape transformation processes of real sub quantum rigid stringy fully entangled particles. 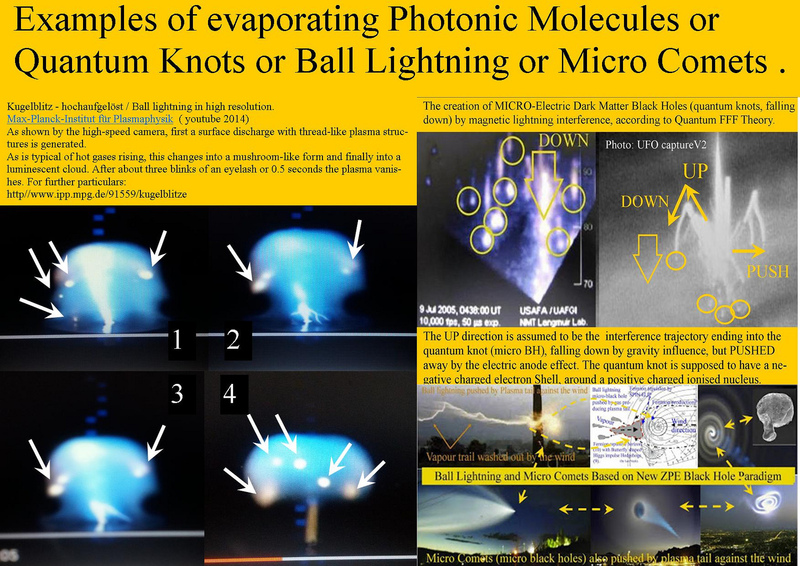 Each particle is supposed to be entangled with 8 or 12 CP symmetric particles located inside 8 or 12 universal bubbles at long distance. Those particles are supposed to be based on only one original transformable ring shaped massless virgin particle called the Axion/Higgs particle assumed to be the product of the symmetric cyclic big bang nucleus as the creation of a limited symmetrical multiverse equipped with an even number of material and anti material universal bubbles. 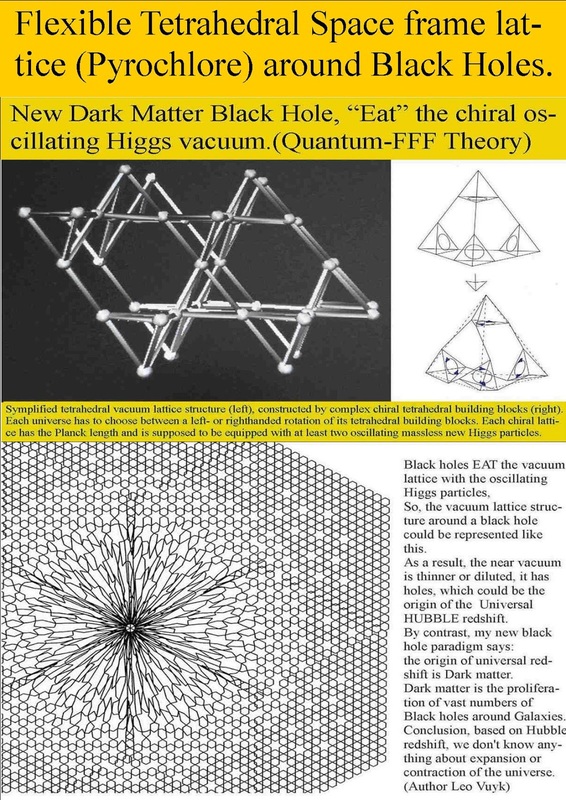 The Q-FFF theory is called Semi classical because in addition to the ring shaped transformable rigid string particles, all universal bubbles are assumed to be each others Charge Parity (CP) mirror symmetric universal bubbles which are assumed to be instant entangled down to each individual string particle created out of the Axion Higgs splitting cold Big Bang. Dipole Repeller Quantum Gravity and monopole interference micro black holes. with New Physics plasma tail propulsion. 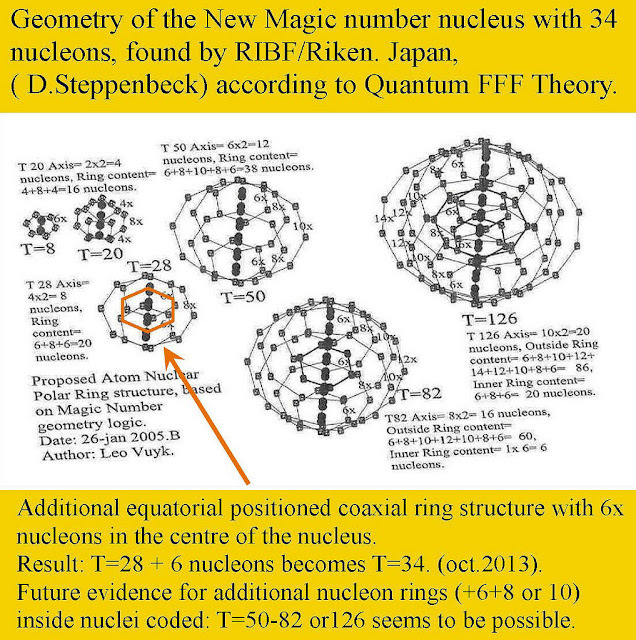 Het Quantum Function Follows Form model. Als architect ben ik geinteresseerd in de mogelijke allerkleinste z.g. 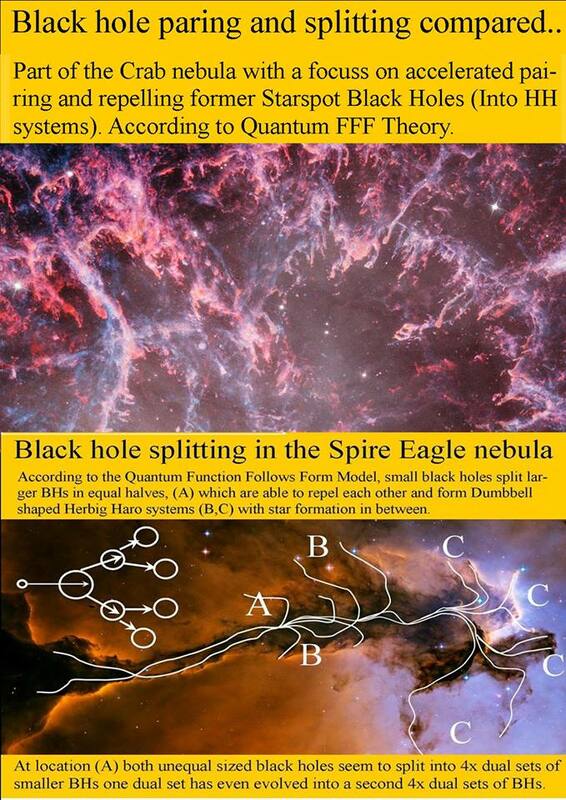 "sub-quantum" VORM van elementaire deeltjes in de natuur en het universum. De naam "Quantum Function Follows Form model" geeft in het kort daarom het belang van de relatie tussen de Vorm van een deeltje en de Functie ervan weer. 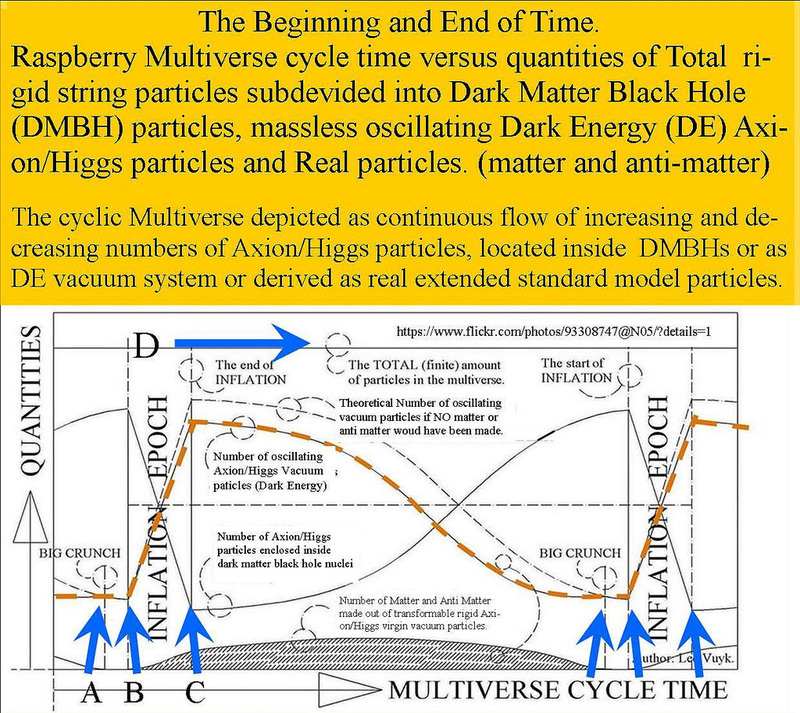 Door botsingsprocessen tussen deeltjes kan de vorm van die deeltjes veranderen volgens bepaalde wetmatigheden die besloten liggen in de interne mechanica ( structuur) die elk deeltje al bij de big bang heeft meegkregen. Het blijkt mogelijk om een logisch verband te ontwerpen tussen de veranderbare vorm van het z.g. massaloze standaard deeltje genaamd het "Axion -Higgs deeltje", ( A-H deeltje) dat ons vacuum lijkt te vullen oscillerend in tetraeder vorm en de basis is van de z.g. 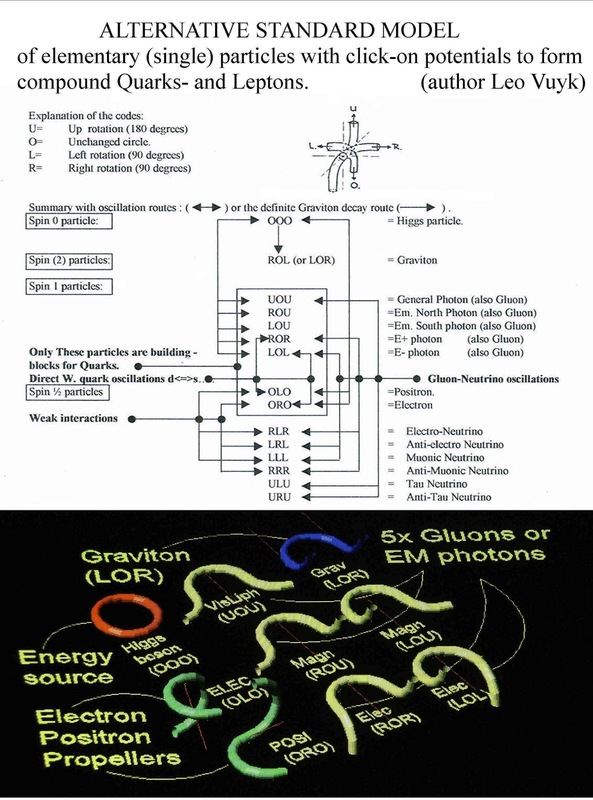 "donkere energie" waardoor alles in het universum beweegt. 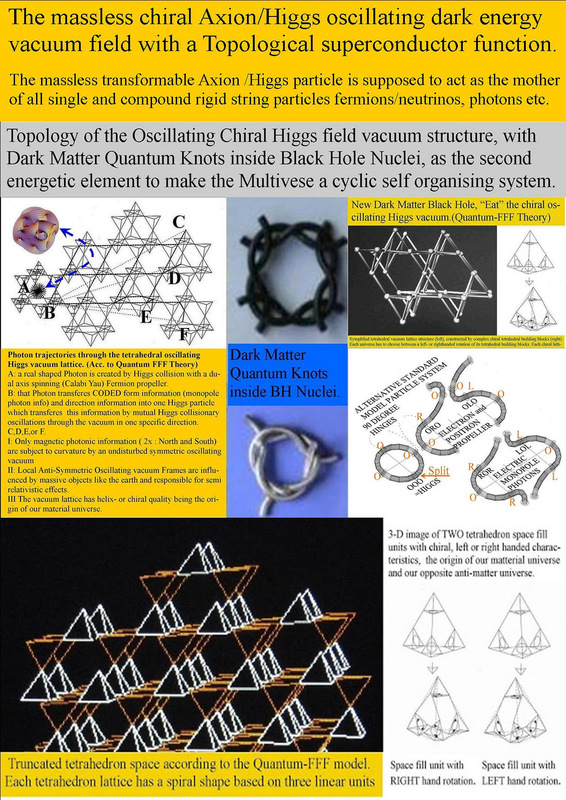 Om dit te bereiken heeft het A-H deeltje een ring ( Torus) vorm meegekregen voorzien van drie scharnierpunten en een splitsingslunt die alle vier gelijkmatig over de ring vorm zijn verdeeld. Elk scharnierpunt heeft vier vaste ( klik) rustpunten eveneens gelijkmatig verdeeld over de 360 graden van het scharnier, dus elk met een klik rotatie van 90 graden. 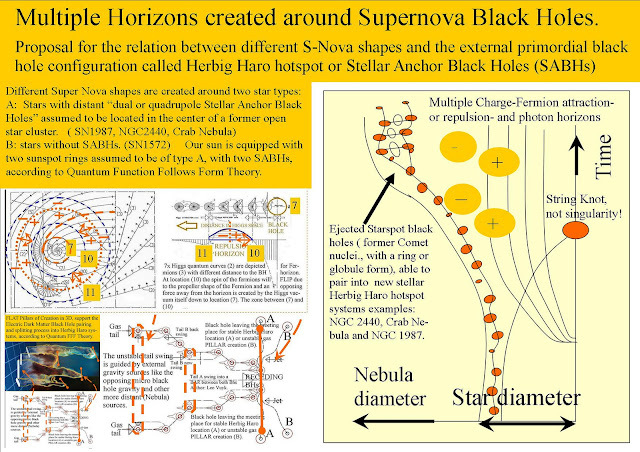 De gevolgen voor Black Holes en (dipole repeller) Quantum zwaartekracht, zie laatste posters hieronder. 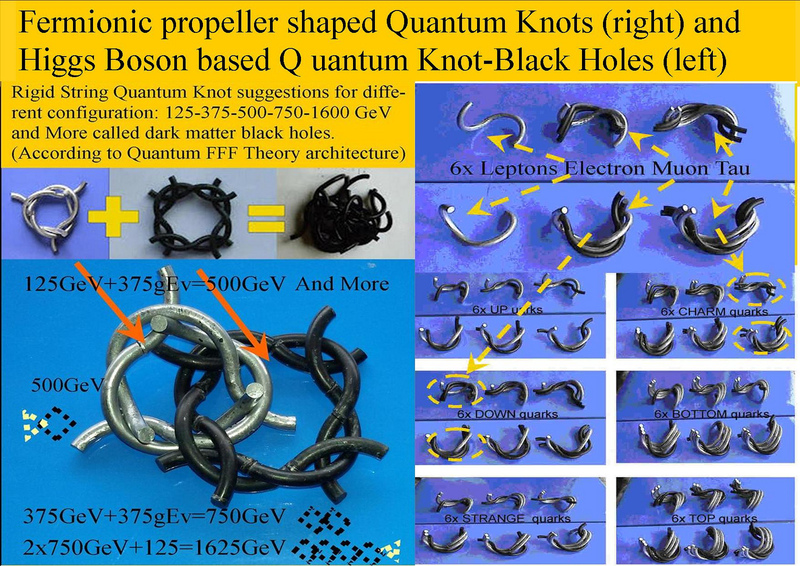 Quantum Function Follows Form model. 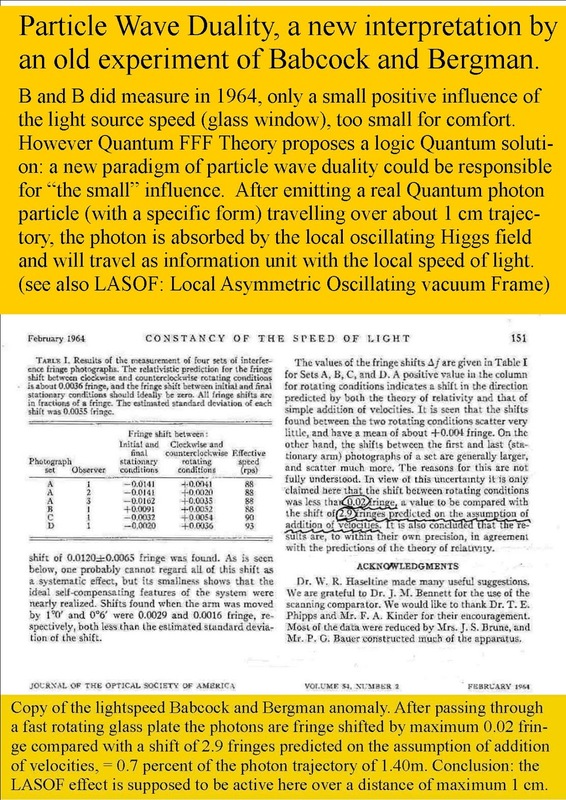 As an architect, I am interested in the possible smallest so-called "sub-quantum" SHAPE elementary particles in nature and the universe. 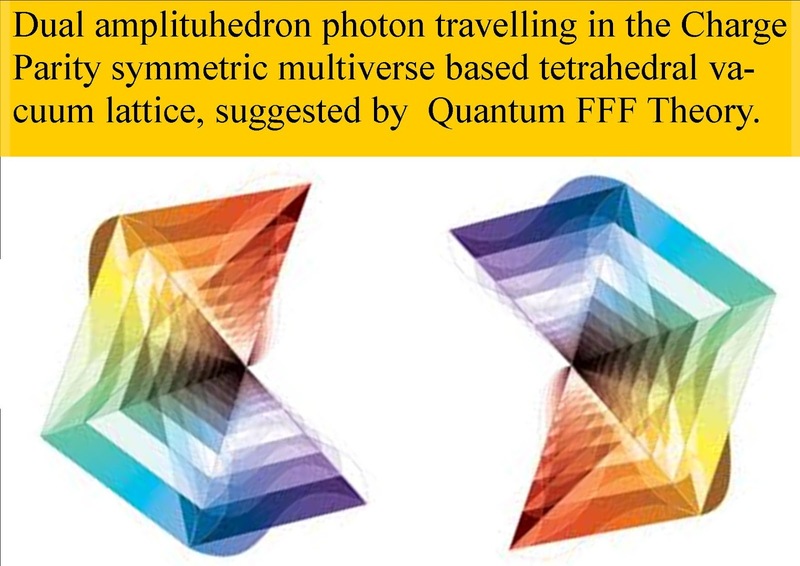 The name "Quantum Function Follows Form model" gives in brief the importance of the relationship between the shape of a particle and its mode. 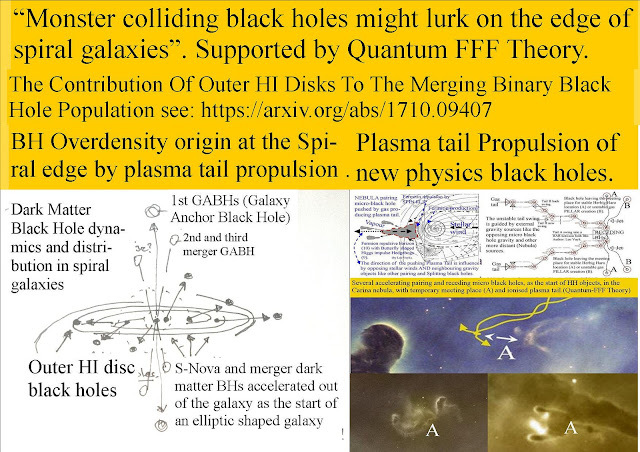 By collision processes between the particles it can change the form of particles which change according to certain rules that are inherent in the internal mechanics (structure), which each particle already has earned at the big bang explosion.. 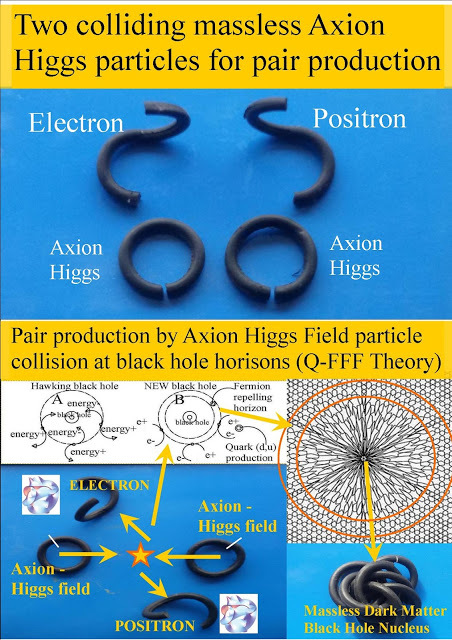 It turns out to be possible to design a logical connection between the variable shape of the so-called mass-less standard particle called the "Axion -Higgs particle", (A-H particle) and its function. 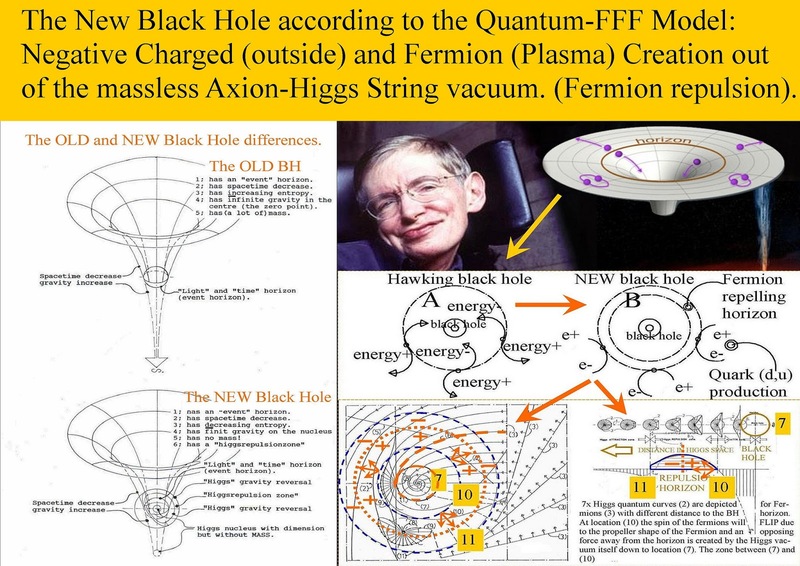 The A-H particle seems to fill up the vacuum around us, and is the basis of the so-called "dark energy" through which everything moves in the universe. In order to achieve this, it has been given a particle AH ring (Torus) form provided with three pivot points, and a splitting point which are distributed equally over the ring shape. 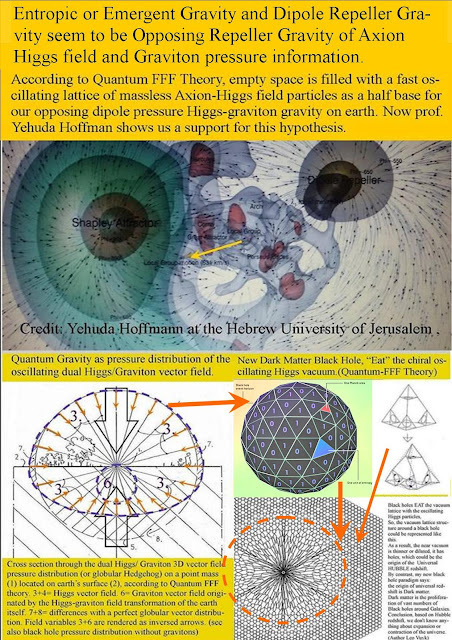 Each pivot point has four fixed (click) resting points which are also equally distributed over the 360 ​​degrees of the circular hinge, so each one-click rotation is 90 degrees.